Each day brings hotter temperatures and heat bubbles that threaten to destroy the earth. Amid this global heating crisis, Piper lives under the oppressive rule of her mother, who suffocates her even more than the weather does. Everything changes on her eighteenth birthday, when her mother is called away on a mysterious errand and Piper seizes her first opportunity for freedom. Piper discovers a universe she never knew existed—a sphere of gods and monsters—and realizes that her world is not the only one in crisis. While gods battle for control of the Underworld, Piper’s life spirals out of control as she struggles to find the answer to the secret that has been kept from her since birth. An imaginative melding of mythology and dystopia, Solstice is the first YA novel by talented newcomer P. J. Hoover. I don't know about you, but I can't wait to get my hands on this one and it will be a wonderful addition to the Young Adult section on your bookshelf! 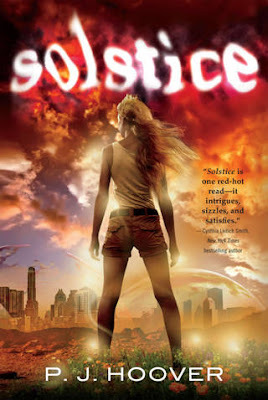 To celebrate the SOLSTICE cover reveal, PJ Hoover will be running a contest on her blog today in which she'll be giving away a handful of books, so be sure to visit her blog and enter for a chance to win!